Nadine and I went for our regular manicure and pedicure when I wore this. We go every 2 to 3 weeks and almost always get both our nails and toenails done. I soo recommend this to everyone! Men and women, go do it if you have never done so! By the way, if you feel apprehensive about doing this, (regardless of how you are presenting), I have been to many, many different salons with my SO, with him presenting as a man ad a woman, and we have always been treated just like everyone else. Also, I have seen men and women at these salons of all ages getting nail work done, and they are all treated the same! Give your fear a rest and go for it! I bet you will find it is wonderful. I really like this top!! Of course, its in blue, one of my preferred clothing color choices. It also has awesome tear shaped cut outs around the neck line, so cute! I think these cut outs give this kind of plain shirt some flare. It is a stretchy material that makes it very comfortable, as well. This shirt is fairly casual yet I have worn it with a skirt, too. The shorts have made an appearance in one of my posts here. They are a white denim like material. 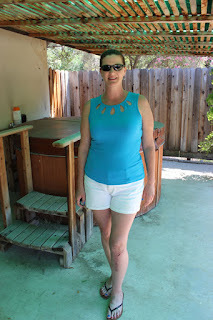 These shorts are a go to for me; they are cute, comfortable, and versatile. I do really like being comfortable, especially when going to the nail salon. It seems to me that most people have some clothes that they wear more often than others. I do, I really do! The shoes are a very flat leather flip flop. 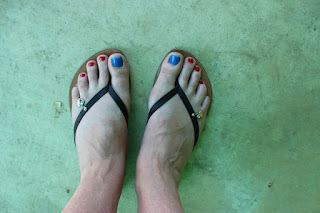 They are great for pedicures because they slip on very easily after having my toes painted. My favorite part of these flip flops are the little silver hearts attached tot he straps. Each heart has a little crystal in them that looks like a diamond. So cute! 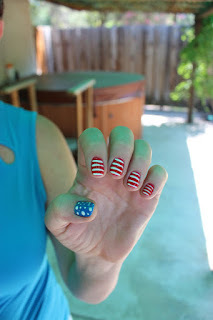 Also I wanted to show off my nails that I got in honor of the fourth of July. 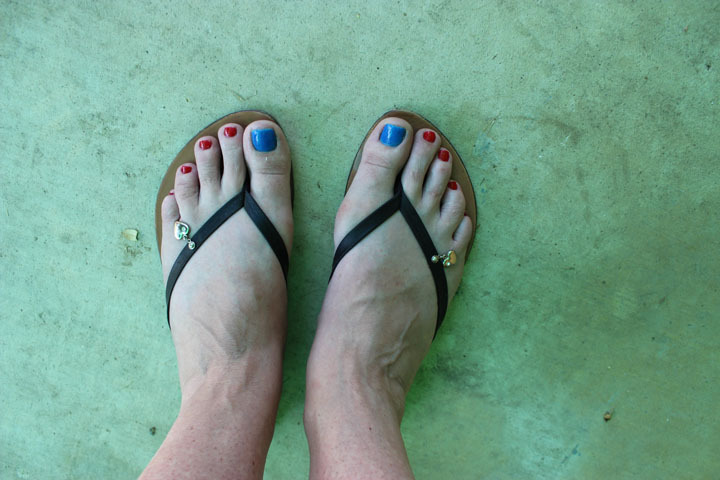 As you can see above, my toes are painted blue and red; my fingers somewhat match, just a little fancier. The nail designs were my idea, which is kind of rare as I usually look up nails on Pinterest and copy one of them. That is all from me today. Hope you are well and in good spirits! Go out and try something new! You never know, you might jest love it!! Thanks, Daria! I never thought about it that way. But they do look like little decorated cakes! Now that you mention it, that would a great way to decide on new designs by thinking about my nails as tiny decorated cakes.